It is the only venomous snake species in Ontario, and although its venom is potent, this is a small snake with small fangs and a limited amount of venom. 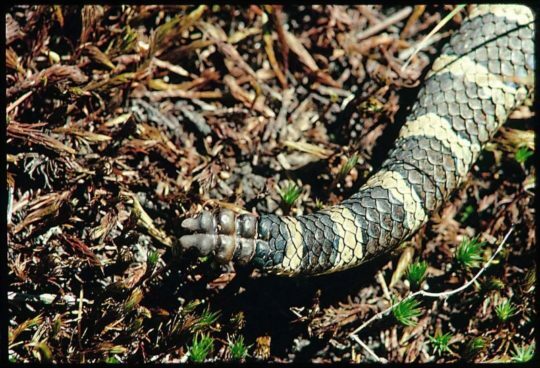 Snake bites are rare; approximately 2-3 per year and with treatment, a full recovery is highly probable. 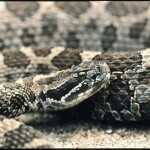 If you see or hear a rattlesnake, simply leave it alone! If you give the snake room it will retreat. 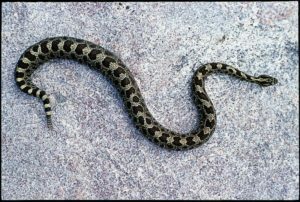 Medium-sized snake (50 to 76 cm.) with a thick body. Thick tail does not taper to a point and ends with a distinct segmented rattle. Rattle segments are added when the snake sheds its skin. Neck is narrow in contrast with the wide head and body. Bow-tie shaped dark brown blotches along back with two or three rows of spots along sides, grey background colour, dark belly. Dark lines extend from eyes to neck, vertical pupils (cat-like), heat sensitive pits between nostril and eye. May live in captivity for up to 20 years. Small mammals including voles, mice and shrews. Hibernates below the frost line from October to mid-April. A rock fracture, root pocket or rodent burrow provides a suitable site. In eastern Georgian Bay, these sites are often associated with damp areas or wetlands. Emerge from hibernation in late April. Uses venom to subdue prey. Shy, secretive, non-aggressive snake. Relies on camouflage and remaining still to avoid predators. Heat sensitive pits on head allow it to sense warmth in the vicinity while hunting under the cover of darkness. They reach sexual maturity at age 4 or 5 and mate mid to late summer. A female may reproduce every 2nd or 3rd year. Pregnant females will seek out “gestation” sites. These sites provide safe cover and a good range of temperatures so they can incubate their young. In our area, “table” rocks are often the preferred sites and a female will return to the same site each time she is pregnant. The average litter is 12, and the young are born usually in August. Newborns are 20-25 cm long and similar to adults but lighter in background colour. Their rattle is yellowish in colour. The fangs and venom are present at birth. Found in rocky scrub habitat, damp lowlands, open woodlands, bogs, and fens. 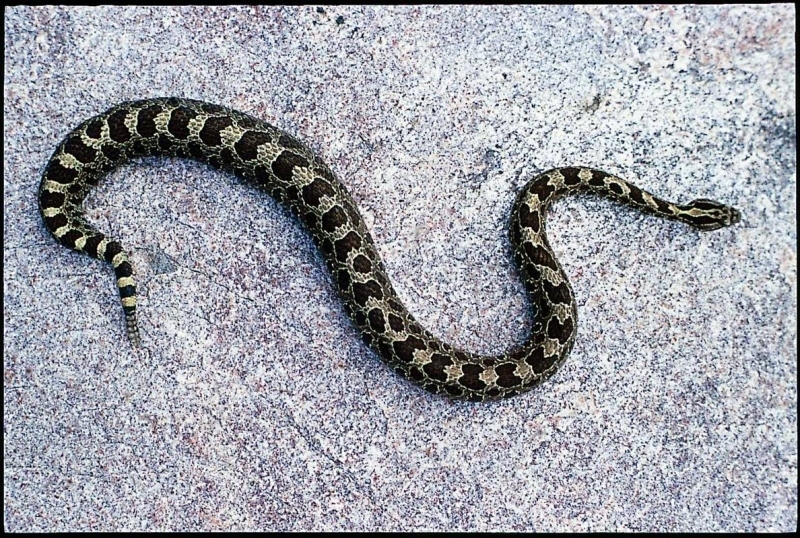 For more information on how to prevent and treat rattlesnake bites –Snake Saftey Tips. 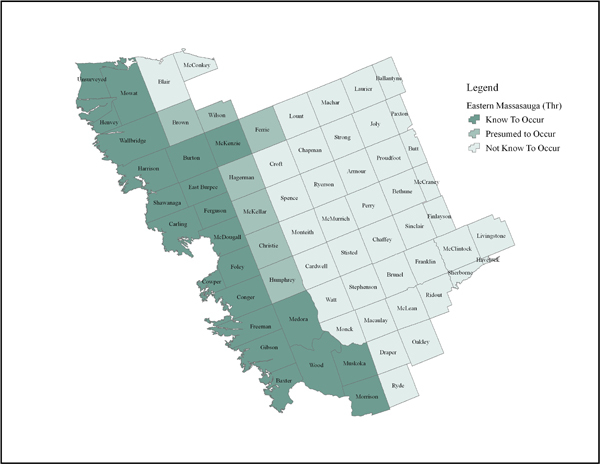 Guidelines for identifying important Massasauga Rattlesnake habitat are available at Parry Sound OMECP. Safety note regarding the use of silt cloth. How to safely move a rattlesnake. 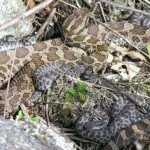 A “Working in Massasauga Habitat” DVD is available. Please contact us for a copy.